Iron Maiden have unveiled the analog version of their new live package, “En Vivo!" The double vinyl picture disc edition of En Vivo! 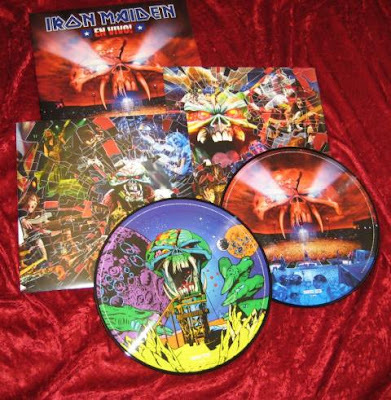 features mascot Eddie on each album, as well as on the inner sleeves, along with shots of the band members. The live package will be available in several versions, including Blu-Ray, DVD, Limited Edition double DVD in Collectors Steel book case, 2CD, Digital Download, CD soundtrack album and Digital Download Video. EN Vivo! Will be released March 26 (March 27 in North America). Earlier this week, Maiden released video of their performance of “Blood Brothers” from the live set. The band launch their 2012 Maiden England North American tour on June 21 in Charlotte, North Carolina; Alice Cooper opens shows for the first month before Coheed & Cambria climb aboard.